Spain’s Rioja region has been growing in fame and quality for the past century. These Tempranillo-based wines are worth exploring. AMONG THE LARGEST and most dynamic wine regions, Spain produces twice as much wine as the United States. Within Spain, arguably the most interesting region is called Rioja, where the red grape Tempranillo dominates vineyards. The history of Rioja goes back a millennium; it rose in fame in the 19th century, when phylloxera devastated the vineyards of France. Many French winemakers turned to Rioja to get them through the most difficult times. This not only brought recognition to the region, but the Bordeaux winemakers also brought expertise and upgrades. Here are three Riojas worth seeking out at your favorite wine merchant or online. • Miguel Torres Altos Ibericos 2012 Riserva Rioja, $16: A robust red with aromas of dusty plum, blackberry and cocoa, followed by flavors of black cherry, plum and ripe raspberry, all backed with taut tannins. • Carlos Serres 2011 Reserva Rioja, $16: Gravelly aromas of cherry and plum, and robust flavors of dark chocolate and plum. Rounded tannins meld with bright acidity to give this wine plenty of structure for roasted meats, hearty dishes and winter stews. • Carlos Serras 2016 Rioja Blanco, $10: A beautiful white with aromas of florals, citrus and lemongrass, followed by flavors of Asian pear, Golden Delicious apple and hints of tropical fruit, particularly pineapple. Perfect with steamers, grilled fish or scallops. Sauvignon blanc lovers will love this wine. Made primarily with the rare Tempranillo Blanc grape, a mutation of Tempranillo found only in Rioja. In the past three decades, a string of good vintages has helped raise the profile of Rioja once again after a half-century of war devastated the region and the wine trade. 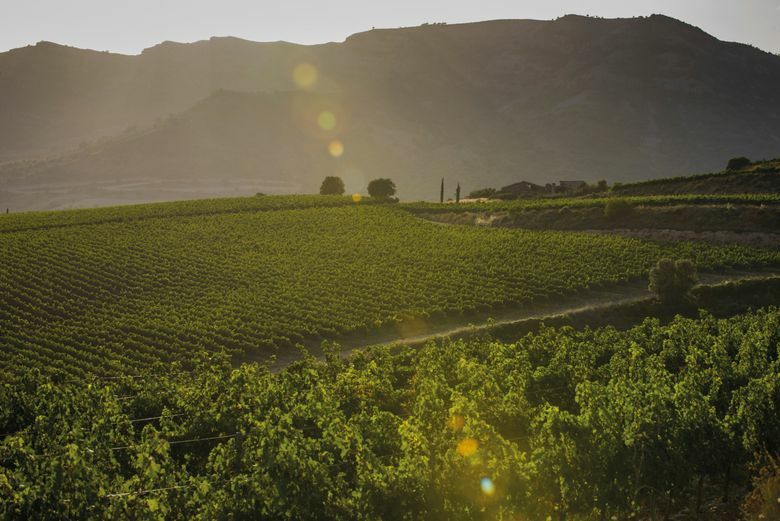 Rioja is blessed with dry conditions, warm days and cool nights, which combine to provide ripe fruit while capturing all-important acidity that lifts up the flavors and gives them the opportunity to age gracefully. This sounds a lot like Washington’s Columbia Valley, which is likely why we are starting to see more plantings of Tempranillo in Washington. Washington wine drinkers should be able to easily explore Spanish wines, thanks to a number of importers of Spanish wines in the Interstate 5 corridor, according to Doug Charles, owner of Compass Wines in Anacortes. In 2014, Ste. Michelle Wine Estates teamed up with Spain’s largest producer, Miguel Torres, to become its exclusive importer. Last year, Ste. Michelle imported and distributed more than 90,000 cases in the United States. Generally speaking, Spanish wines are affordable, so getting into Rioja wines and exploring them is much easier financially than wines from France. The most expensive and most interesting wines are those that carry the word “Reserva” on the label. Unlike in the United States, where the word “Reserve” has little meaning outside the whim of the winemaker or marketing department, such words do have meaning with Spanish wines. For example, “Gran Reserva” must be aged two years in oak and three additional years in bottle before release. Of course, this additional cost in time is no guarantee of higher quality, but the resulting wines are often more interesting to drink.